Magnolia bark extract is an ancient herbal remedy from Ancient Chinese medicine. The Ancient Chinese used magnolia bark in combination with a number of other herbs and plants. Modern science is now exposing the health benefits of magnolia bark supplements. You can use magnolia bark extract as a dietary supplement to help promote a calm, relaxed state, and to promote healthy sleep. Magnolia bark extracts also have a number of potential health benefits including improving cortisol and glucocorticoid levels, and reducing inflammation. Animal studies have shown that magnolia bark has the potential to significantly reduce stress. Unfortunately, human studies usually use magnolia bark with other herbs, making it hard to determine whether the effects are from magnolia bark alone. Read how to take magnolia bark! 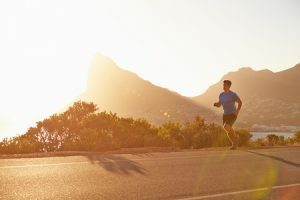 In 2013, researchers published a study in the Journal of International Social Sports Nutrition, showing that magnolia bark extract (combined with Phellodendron amurense) helped to reduce cortisol levels in 56 participants. In a number of animal studies, researchers have shown that magnolia bark extract has the potential to reduce inflammation and improve glucocorticoid levels. Although promising, these results don’t show for sure that magnolia bark can reduce inflammation in humans. More human studies are needed before this can be known for sure. Most recommended doses for magnolia bark are based on animal studies. Ancient Chinese cultures used magnolia bark in combination with a number of other pharmacologically active herbs and plants. The recommended dosage for magnolia bark extract is around 250 – 500 mg. This dosage range may be effective at stimulating GABA receptors, reducing anxiety and stress, and improving sleep. Magnolia bark is listed as possibly safe on WebMD, a good source of information about side effects of supplements. Most human studies on Magnolia bark have combined magnolia bark extract with other herbs. Magnolia bark extract should not be used by pregnant women or breastfeeding women and may be dangerous to use before surgery. It is recommended to stop using magnolia bark supplements at least 2 weeks prior to surgery. 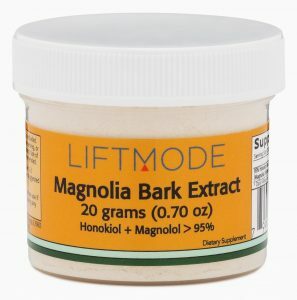 Liftmode.com’s Magnolia bark extract is not intended to treat or cure any disease or ailment and is sold strictly as a dietary supplement. Please consult your physician if you have any questions, any underlying medical conditions, or are taking prescription medication. In conclusion, magnolia bark extract is a great dietary supplement for promoting healthy sleep, reducing stress, improving cortisol levels, and promoting healthy glucocorticoid production. Magnolia bark extract is a dietary supplement and is not intended to treat or cure any ailment or disease. More human studies would be great to show more of the benefits of magnolia bark.